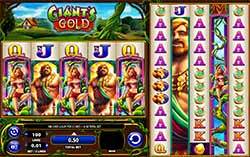 Explore a different take on a classic adventure with the Giants Gold slot machine from WMS! This 100-line video slot is based off the classic tale of Jack and the Beanstalk and features that player-favorite colossal reels feature. The Colossal Reels open up plenty more winning opportunities for you because of the incredible amount of lines available. In effect, the main game board is made of five reels and four rows, which are joined by a further five by twelve set of reels which is perfect for bringing the beanstalk itself into play. Beanstalk Wilds – The beanstalk is the game’s wild card which gives you plenty of opportunities to hit a big win. Stacked wilds are available and give a boost your winnings over the numerous win lines. If it stacks on the main board, then it will also transfer to the corresponding reel on the extra board, so you’ll have plenty of wild cards to play with. Golden Egg Bonus Round – The other key symbol is the golden egg, which needs to appear three times on each set of reels in order to launch the bonus round. The first three eggs launch the round with five spins, with one more for every other egg in view. If you’re lucky enough to spin in forty or more eggs – perfectly possible with eighty symbol areas – then you’ll scoop a stunning one hundred free spins.